When developing HTML5 canvas apps, performance is extremely important to the user experience. Graphics and CPU performance can be very limited especially on mobile hardware and browsers. 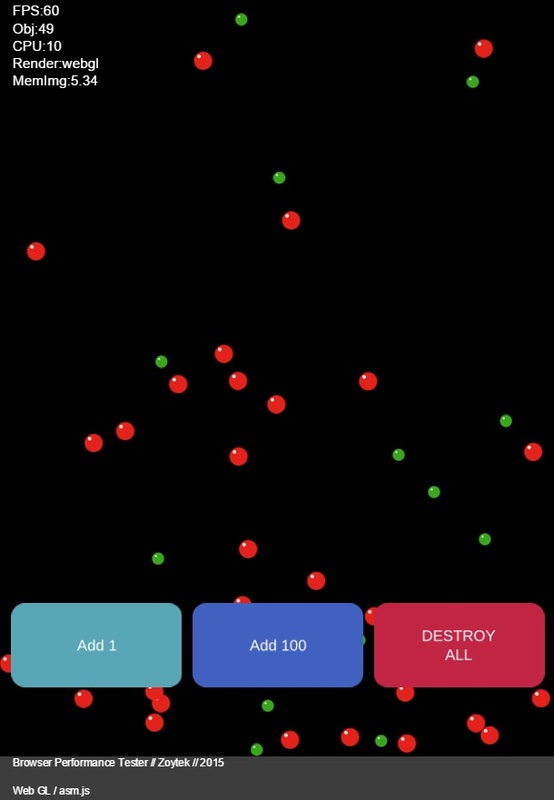 Zoytek have developed a tool to test CPU, graphics and browser speed by running a Brownian Motion style physics collision simulator. The more particles added the greater the load on the system. Keep adding particles until the frame rate drops, giving an indication of when the system is starting to slow down. Desktop browsers will almost always perform better than mobile, mainly due to more powerful hardware, though mobile devices are catching up. FPS: Frames per second, usually 60FPS until extra particles are added. WARNING: Too many particles will slow down the performance of the browser. Use Reset or force close the browser if it becomes unresponsive.